Zombie-Opoly is the rotten version of the classic property trading board game. Grab your tokens and advance to 'Rrrrrrrr'! 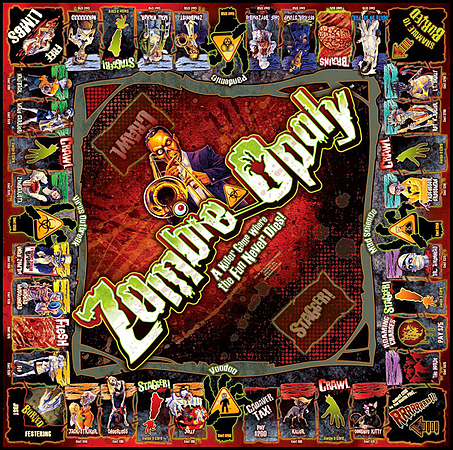 Players continuously travel around the Zombie-Opoly board, buying their favourite zombies and increasing the rent by purchasing boxes of flesh and screaming humans. The lucky players will be re-animated but be careful to avoid having your blood spewed and bitten or being sent to 'BURIED! ', putting you out of the game for three turns. Can you buy, sell, trade and deal some gruesome zombies in order to win Zombie-Opoly? Choose either traditional play or a one hour version. The last player to have money remaining, or the player with the most money after 1 hour, will be the winner.